Is Your Apple Wearing Makeup?! A question asked by my client about apples, urged me to share some information with all of you on this topic. I am sure most of us would have come across this: Wax on apples! Either most of us are not affected by the hoax and continue eating it, or most of us would have started looking for other options. What do you think? Is it a hoax or the truth? Let me demask the fruit! Yes! The shiny and tempting apples you buy for your family has a layer of wax on them. Not only apples, many other fruits and vegetables have a wax coating that makes them look better and last longer. But the wax that is used is edible and safe to consume. Most of them are natural waxes like carnauba wax obtained from the leaves of the palm tree and candellia wax got from a variety of shrubs grown in deserts. These waxes are certified as edible. 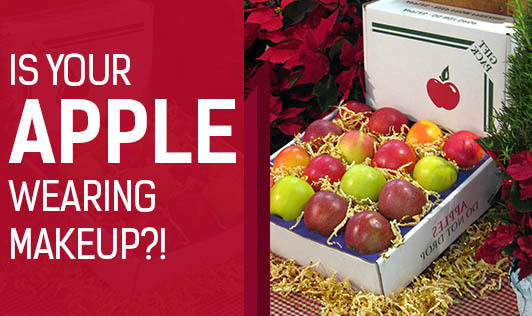 Apples already have natural wax that protects them from spoilage. In order to increase its shelf life and prevent damage, they are coated with edible wax to withstand the process of packaging and transportation. Wax not only inhibits mold growth, but also prevents bruising and helps retain its moisture. Each apple is coated with only one or two drops of wax. Many times, producers also use petroleum based wax for this purpose. • Hot water technique: Immerse the apples in hot water for 10-15seconds and immediately wipe it dry with a kitchen towel. • Vinegar or Lemon juice technique: In a bowl of water add one tablespoon of baking soda and one table spoon of vinegar or lemon juice. Using a vegetable brush, scrub this mixture on the apples and rinse thoroughly. Whether it is organic or it has been purchased from a street vendor, apples are subjected to a wax coating. And these techniques are the best and the safest ways to ‘remove the makeup off your apples'!